This pamphlet collects articles written throughout 2010 on the economic crisis in Greece, the state's austerity agenda, and the response to it by the working class. We don’t intend to make a habit of it, but this letter is not one text but the juxtaposition of several texts written at different times. Greece was a leading news item on the occasion of the riots in December 2008, during the opening of the state debt crisis in January 2010 and, starting from February 2010, because of the reactions to the austerity measures and the attack on wages, and then finally during the May days, which were marked by violent confrontations. Concerning the riots of December 2008, there already exists a pamphlet in English, ―Everyone to the streets. 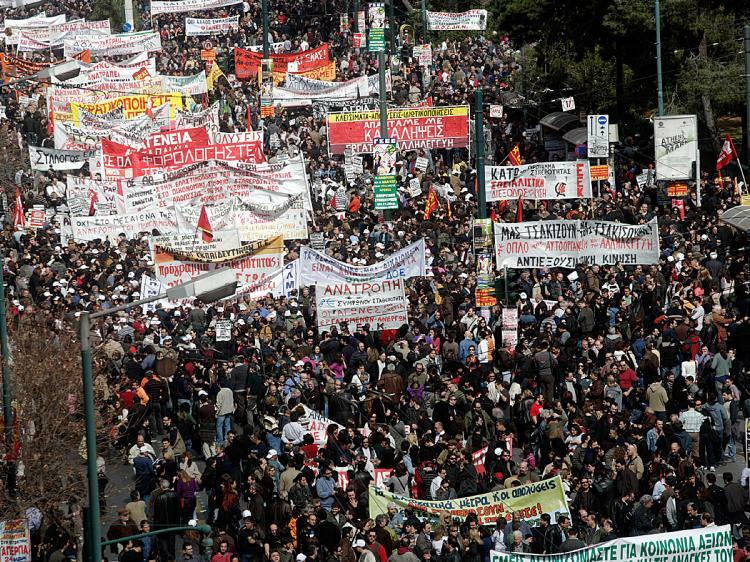 Texts and Communiqués from the Greek Uprising” published by some comrades around the ―56a Infoshop‖ in London in October 2009, and containing texts by TPTG and Blaumachen. This publication’s narrative of events and its chronology are a good place to start. We have focused on some criticisms addressed to the movement and some interpretations of it. capitalist development in this geographical area and quickly setting out a balance sheet. Greece is far from being a backward country on the brink of the abyss. The history of capitalist development and workers’ struggles has given a particular character, as in numerous other countries, to the fiscal crisis of the state. Weakened as it renegotiated its bank loans the state saw its debt attacked on the markets via the CDSs (Credit Default Swaps) whose mechanisms we’ll explain later. the demonstrations which repeatedly crossed Athens, Thessaloniki and other cities. Here it is necessary to avoid lapsing into either blissful enthusiasm or contempt for the trade union demonstrations of the supposedly “guaranteed” and “integrated” employees to which it would be idiotic to oppose the riots of December 2008. We must understand at the same time the strength of the imposing, sometimes violent, demonstrations and the weakness of the present proletarian movement which is incapable of generating strikes and autonomous political organisation. Rather it is necessary to consider the always significant presence of PASOK (the Socialist Party) as much as the KKE (the Stalinist party) via their powerful trade union intermediaries, as well as the divisions within the class itself, including the very visible one between “immigrants” and “Greeks” and even that less important but still serious one, between “public” and “private” sector workers.